Hey guys I thought I would post something a little off the usual Hummer chat. 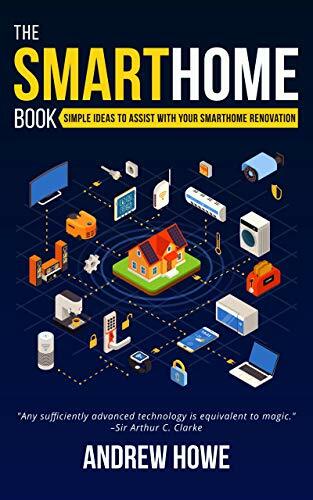 I've just released an ebook on smarthomes. I've looked around and most of the ebooks I found were either focused on working with alexa/siri, or go completely the opposite end of the spectrum and focus on the more complex side of things like programming Arduino's or AMX/Crestron style systems. I've aimed at something in between. If you need guidance on what kind of cables to drop, or you just want to get more of an idea what you should be speaking to your installer or builder about before a renovation or development gets underway then I think this will be useful for you. i take a room by room approach, as well as include 70 cool and useful ideas that you could potentially incorporate into your smart home project. If anyone's interested in finding out more, feel free to reach out to me directly, or you can see it on amazon here. Nice..... At my shop I'm using the overly complicated to configure setup. Crestron. Fortunately I have full access directly from Crestron to all of their very hard to get software, firmware, etc. that are pretty much required for configuring their stuff. Even with the software though, it is extremely complicated to configure and make a really nice looking UI. Right now I have 12 amplifier channels (6 stereo pairs), 3 AM/FM tuners, 1 Sirius/XM tuner, and a media server. I use it primarily for employees to be able to select and play music in different areas of the shop. I eventually want to integrate other things into one interface though but with the different brands and technologies I'd just about have to replace everything with one brand. The Crestron does have some very powerful abilities to integrate other things though but its complicated to get the programming just right. I have a Honeywell security system (Vista) which I have a Tuxedo for that has Z Wave. I swapped out all 4 thermostats to ones with Z Wave so I can use that Tuxedo interface in a browser to control security and thermostats. It can also display a couple of the IP cameras but not all. So then a third interface which is the Dahua NVR with 32 cameras. I know I can add some more Z Wave stuff like lighting controls, and even locks. But the Tuxedo interface is very limited in what all it can do and how you can customize it. Would be nice to have one browser based interface (SSL plus login/pass required) to be able to control all of it in one nice UI but not much is going to let me do that without a major expense in both money and time. Insteon with Hub here. It all works like it is supposed to via the smart phone app and keypad or other controllers. Mainly lighting, fans,T Stat, outdoor motion detectors, timer functions, and open/closed sensors for the 1st floor windows and doors tied to an alert module. Nice to have the porch light come on when you walk up to stick the key in the door. One of my favorites is the Garage Door status sensor, have it so a red light comes on in keypads in the great room and kitchen so I know if I left the door open or if anyone tampers with it. Before I had that, several winters back, I was shoveling snow out front on a super cold under 10F day, had my garage door opener hooked on my back pocket, closed the door and forgot about the opener. Sat down on the couch for a beer to relax and it opened the door. Must of had the door open for an hour, damn near froze stuff inside the garage with the heater trying to warm the neighborhood. That alone is piece of mind for guys like me that suffer from CRS (Can't Remember Sheet). My wife locked herself out walking the dog one day, she called from a Neighbor's and I opened the Garage door from my phone at work to let her in. If I was to build a new house, I would buy your book in a minute so I could build in more features and prep for future upgrades. I've heard a few people using Insteon. It's not so big in the UK, and considering i was living in Russia for the last 8 years (recently left) they've hardly had anything like that over there (or anything else really for that matter). I think the US and Australia are leading the way on smart home technology in general. I always tried to stay away from specific hubs - so to speak and go opensource. So I've always favoured things like Home-Assistant, Node-red and MQTT to control various aspects of the home. I really like the fact it can all run off a $25 raspberry pi, so very obtainable for people. Were the sensors expensive with Insteon? Can you mix and match? I.e. does it take a generic input from a third party sensor that you can then include in the insteon ecosystem? I don't mind the digital assistants, we have an alexa and google home. They perform what's asked of them, regarding the eavesdropping, if they want to hear my girlfriend moaning at me or me swearing at the TV it's all good. I figured these companies know far more about me online anyway. Can anyone recommend a good home jack? Do we have anyone here into Photography? Quick Reply: Anyone into Smarthomes or home automation?